There are only a few days until Christmas arrives. With all the ideas that we have been giving you in previous articles, you have everything ready (even placed!) To decorate your house for the occasion. Today I want to focus on the bedroom. Although during these dates the hall or the dining room will be the most frequented spaces by visitors this room also looks wonderful with this type of adornments. In this case, maybe just for you. But who better for? Putting Christmas lights in the bedroom is a great idea to decorate it. 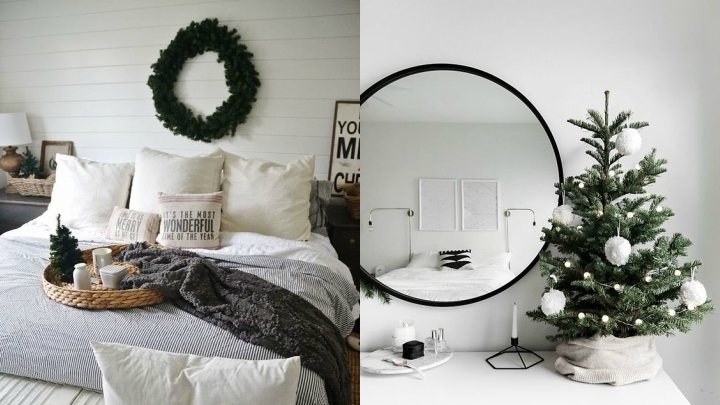 It is not necessary if you do not want the garlands of colors that we usually place on the tree; You have other options more appropriate for this room, for example in white, much more relaxing … Place a garland on the headboard of your bed, or on one of the walls, or a star-shaped lamp. With these little details, you will already notice that it is Christmas. 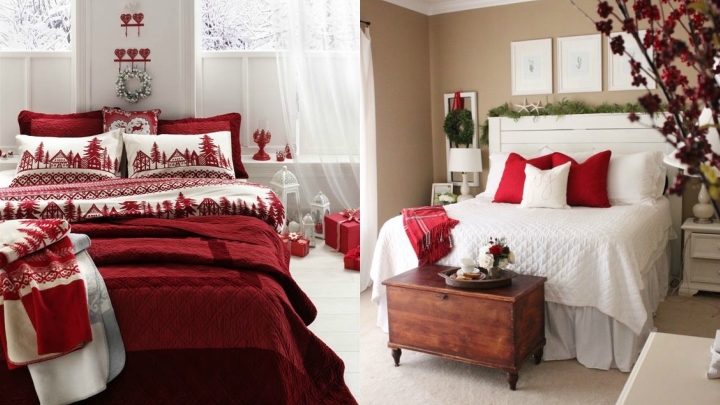 The bed is the focal point of the bedroom and where more Christmas colors can be introduced. Play with shades like red, white and green and with Christmas prints to create an amazing decoration. Reindeer, snowflakes or snowmen … With the quilts and cushions would be enough, but if you want add some blanket at the foot of the bed or a rug. You can be more subtle with small details or bet on the total look. Christmas came to your bedroom! If Christmas is your favorite time, let it be noticed! If you fancy decorating your bedroom in style, choose Christmas bedding, place garlands on the headboard and even a crown on the door. Add some figure on the shelves and a Christmas tree in a corner. Great if it fits, smaller if you do not have enough space. There will be no doubt that you love Christmas. However, if you prefer to bet on something simpler for not saturating the bedroom you also have options. A simple garland as we mentioned before may be enough, you can also put a tree with minimalist style or a small detail hanging from the crank of the room. Sometimes, less is more. The Christmas socks are to be placed in the fireplace, but if you do not have them at home you can put them where you like most. What do you think in the bedroom? I love the idea. Attach them to the foot of the bed, the handle of the entrance door or a wardrobe or even the headboard. No one will doubt where to leave your gifts. You just saw it in a previous photograph. 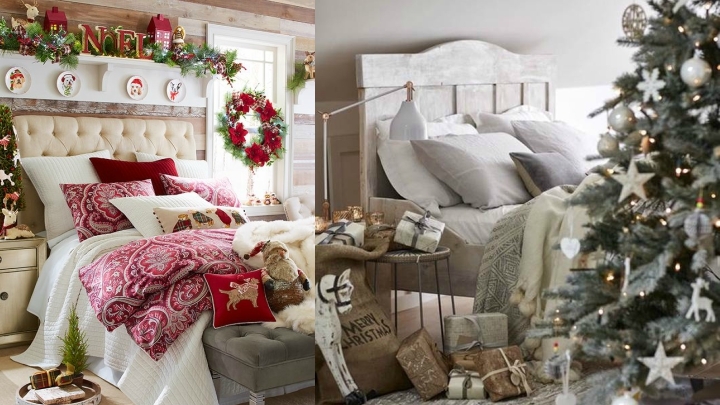 You can add a Christmas touch to your room by hanging a crown on the wall of the headboard. You can do it with your own hands if you feel like it; I remember this DIY that we saw last year so you can design your own decoration. Another alternative is to put a green, simple, with some detail in another color to give a touch of joy.